Historically, partisanship at the Voice of America has been most often associated with Left-wing bias of some of its officials and central English newsroom reporters. 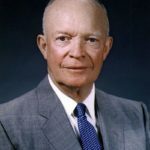 Eisenhower’s words are still a good advice for the Voice of America, which during the 2016 Presidential election campaign showed extreme partisanship in some of its political reporting. In multiple violations of the VOA Charter, pro-Hillary Clinton VOA journalists aired in broadcasts and posted on social media one-sided attacks on Donald Trump and Bernie Sanders. The following year VOA was exposed for airing propaganda in favor of the Iranian regime, but this time, according to an independent study, in a one-sided support of President Obama’s policies while refusing to give sufficient airtime to critics. The World War II and 1956 incidents were of a different nature than Iranian reporting and partisan coverage of the 2016 elections, but they were all examples of biased Voice of America journalism. 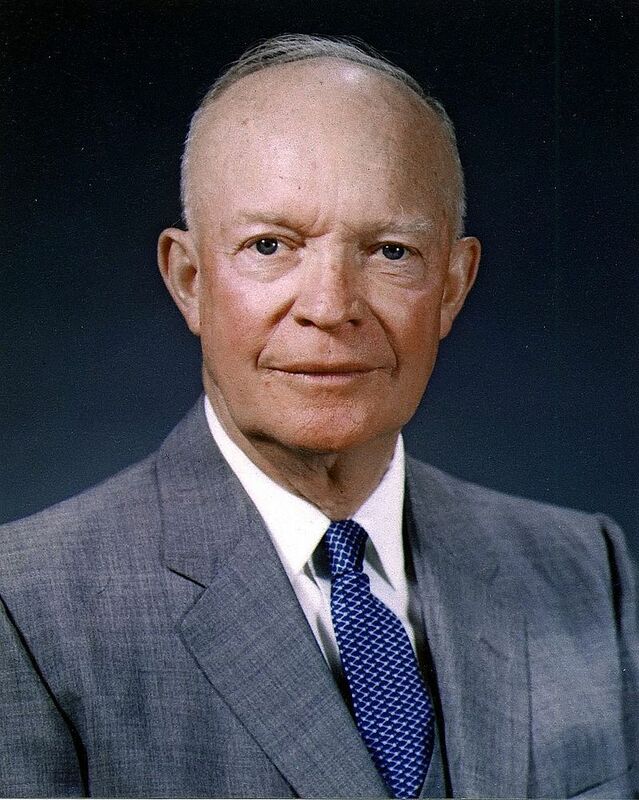 As a former military leader and by then also a former president, General Eisenhower must have been still quite upset to have mentioned in his book more than twenty years later his World War II confrontation with extreme Left-leaning, pro-Soviet political activists at the Voice of America in the Office of War Information (OWI) who had tried to undermine his and President Roosevelt’s political strategy and military campaign in North Africa and Italy. Although the Roosevelt administration was already openly and secretly appeasing Stalin and acceding to almost all of his demands in return for false promises, ideologically-driven VOA propagandists were pushing the policy line favored by the Kremlin and local communists loyal to Moscow which was at times in conflict with specific U.S. political and military objectives in North Africa and in Europe. At the time Eisenhower was fully backed by Roosevelt who, despite his appeasement of Stalin, did not want extreme pro-communist elements within the Voice of America to interfere with U.S. policy or to embarrass him politically in the United States and undermine his broad domestic support. While carrying out Roosevelt’s pro-Moscow policies, neither the State Department nor the Pentagon wanted communist sympathizers to be in charge of American radio broadcasts overseas. Some of these broadcasters suspected of being communists were fired already in 1943 and others left shortly after the war. A few of them went to work for communist regimes in Eastern Europe. They were gone or pushed out long before Senator Joseph McCarthy started to look for communists in the U.S. government, making false accusations even against General Eisenhower. Eisenhower, who did not support and privately criticized Senator McCarthy, mentioned the World War II incident when VOA was already playing during the Cold War a much more useful although still less than fully effective role in countering Soviet propaganda. He had been actively engaged in earlier efforts to create Radio Free Europe (RFE) and Radio Liberty (RL) as more effective media outlets against Soviet Russia. They would remain outside of the direct control of the State Department and were initially secretly managed by the Central Intelligence Agency (CIA). His most critical comment about the Voice of America appeared in a footnote to a paragraph in which he expressed his own concerns with what he saw as VOA’s unethical journalism in support of partisan political advocacy. President Eisenhower was right. In both cases during World War II, and to a much lesser extent even briefly during his administration, some biased VOA officials, editors and reporters sought to create and influence news and U.S. policy through their own commentary and trying to manipulate news to conform with their ideological bias rather than merely reporting on world events. During World War II, General Eisenhower and the Army Intelligence had legitimate concerns that some VOA broadcasters following closely the communist and pro-Soviet line could endanger the lives of American soldiers. The State Department shared some of the same concerns. President Roosevelt’s close friend and advisor, Under Secretary of State Sumner Welles, wrote a secret memo to the White House recommending that some of the more extreme Soviet and communist sympathizers in the Office of War Information (OWI) be removed. They included John Houseman, who was later described as the first director of the Voice of America (VOA) and falsely hailed by some as a defender of objective and truthful journalism. Some of the greatest Soviet propaganda lies were being promoted by the Voice of America under his watch and with his approval. Supported by the U.S. Army intelligence branch, the State Department refused to give Houseman a U.S. passport to travel aboard as a U.S. government representative. Accused of hiring Communists, he and a few other propaganda agency officials were forced to resign in 1943, but others stayed on and continued with pro-Soviet propaganda at the Voice of America for several more years. By 1953, the Voice of America management, then still in the State Department, was changed and the station no longer had a distinct pro-Soviet bias. In response to public criticism and strong pressure from Congress, the Voice of America started to air more detailed reports about human rights abuses behind the Iron Curtain. This was evident in the 1953 VOA Polish Service lineup which included regular broadcasts on exposing Soviet propaganda lies about the United States and conditions within the Soviet Block. 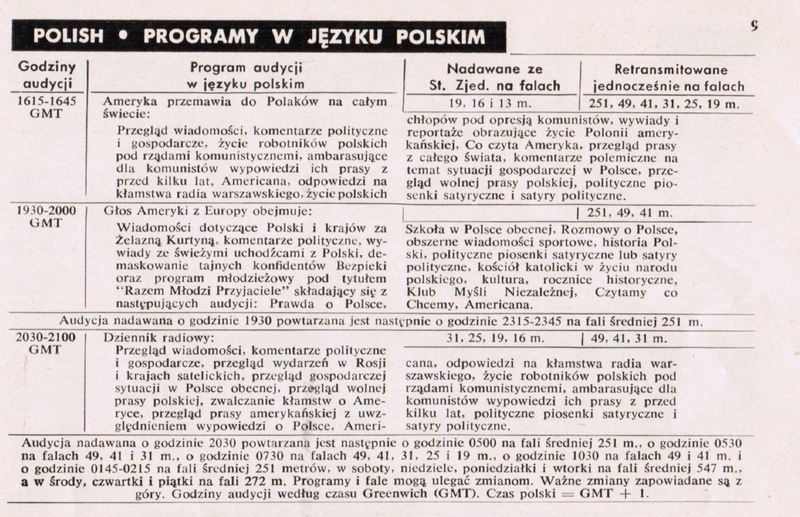 There were far more of such programs in the 1953 VOA Polish Service lineup compared to the 1951 program schedule. Two years earlier, the Voice of America (VOA), which was at that time located in New York but managed from Washington by the State Department, was under heavily criticism, particularly from Republicans in the U.S. Congress, for failing to counter Soviet propaganda. In letters smuggled to the United States, radio listeners described VOA Polish programs as “uninteresting, drab, bureaucratic in tone, unconvincing.” By 1953, almost every VOA Polish program listed in the January-February schedule was designed to promote freedom of expression and expose communist failures. These were not American propaganda lies but polemical journalism although still not as comprehensive, well-informed and hard hitting as Radio Free Europe programs with which VOA tried to compete. In reality, the two American-funded stations complemented each other with somewhat different style of programming. When I joined the VOA Polish Service in 1973 in the period of détente in relations with the Soviet Union during the Nixon-Ford administrations, such polemical programs have almost completely disappeared. RFE was then well ahead of VOA in the number of radio listeners in Poland and remained in the lead for many years. VOA caught up with RFE only during the Reagan administration when restrictions on criticism of the Soviet Union and communism were lifted in the 1980s. Many foreign language broadcasters at the Voice of America were strongly anti-communist and happy to see Eisenhower becoming president. However, some partisan VOA English Service reporters engaged in journalistic activism against the Republican administration. One VOA reporter allegedly tried to get a U.S. senator to criticize President Eisenhower’s decision to send U.S. troops to Lebanon. The senator refused the request and reported the incident. The cover for January-February 1953 The Voice of America World Program Schedules booklet featured a photograph of President-Elect Dwight D. Eisenhower. 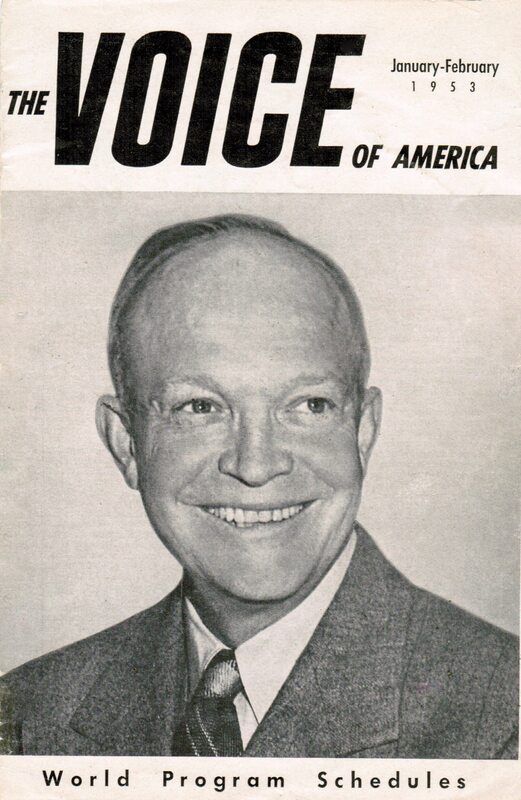 WHEN THE REPUBLICAN CONVENTION at Chicago elected Dwight D. Eisenhower (see Front Cover) as its Presidential candidate last July, THE VOICE OF AMERICA was on the spot to report the dramatic proceedings. Though the months which followed, VOA reporters covered the campaigns of both Presidential candidates extensively, bringing to listeners overseas the highlights pf this latest chapter in American political history, which culminated in Mr. Eisenhower’s election last November. Partisanship has returned to the Voice of America to an unprecedented level under the Broadcasting Board of Governors (BBG)–now called the United States Agency for Global Media (USAGM)–especially during the last two years of the Obama administration. 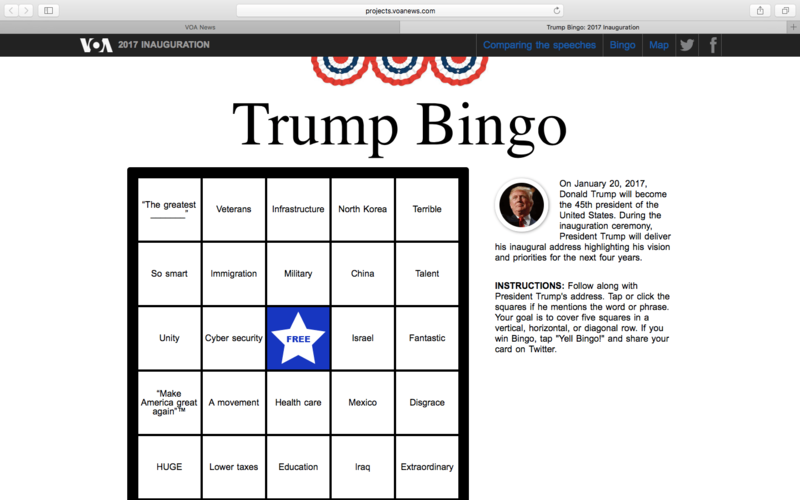 In 2017, some Voice of America journalists were openly mocking President-Elect Donald Trump and his supporters on the day of his inauguration. Such extreme partisan behavior among VOA reporters who are U.S. federal government employees would have been unthinkable during the strongly pro-Soviet Roosevelt administration, anti-communist but still moderate by the Cold War’s standards Eisenhower administration, or any administration prior to the time when the Obama administration-controlled BBG Board appointed its latest management team. This does not imply that President Obama or his White House aides encouraged such behavior or paid much attention at all to the Voice of America, but VOA officials appointed during the last two years of his administration allowed it to happen for the first time in VOA’s history and failed to stop it in a timely manner. Contrary to some reports, usually appearing in more Left-leaning media, which suggest that President Trump may want to bring a Right-wing bias to the Voice of America, it is a Left-wing bias which still dominates Voice of America programming two years into his administration while Donald Trump already effectively communicates his views directly to Americans and the world via Twitter. Every kind of political bias—Right, Left, Republican, Democrat, or inspired by propaganda of a foreign source—when included in Voice of America content is against the VOA Charter and therefore violates U.S. law. Only a non-partisan Voice of America can hope to have bipartisan support for continued funding from American taxpayers. Those who have heard about recent scandals at the United States Agency for Global Media are increasingly questioning why they should pay for any biased U.S. government media outlet although the need for the Voice of America to broadcast to some countries still exists if it can regain its right footing.